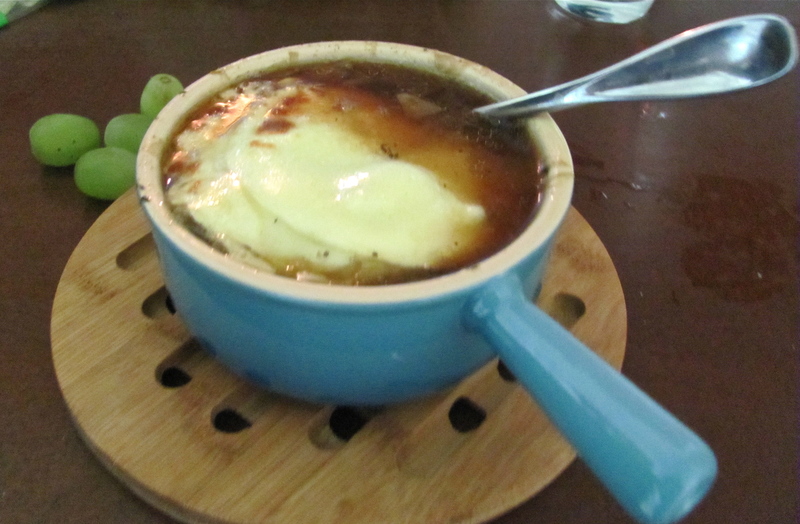 Before finding out about my barley allergy, if a restaurant had french onion soup I just had to try it. 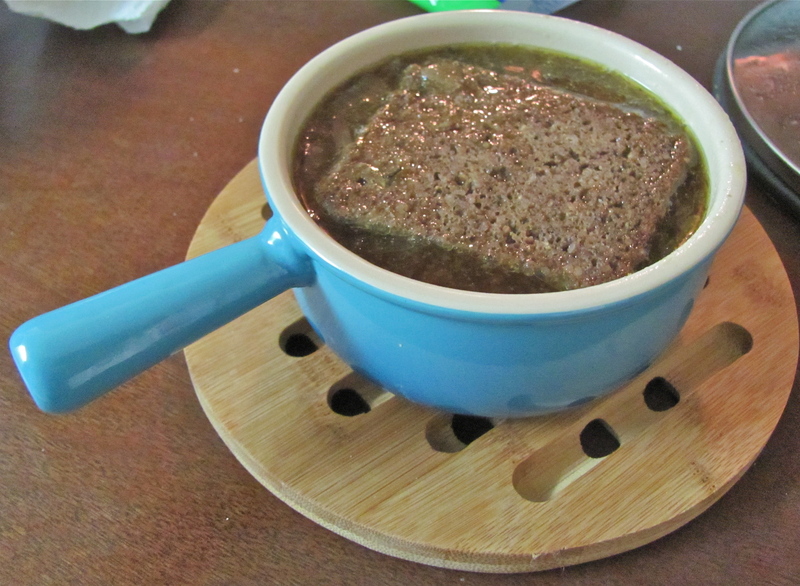 While I slurped on the cheesy, bread soaked broth I would wonder how they got such a rich savory flavor out of onions. 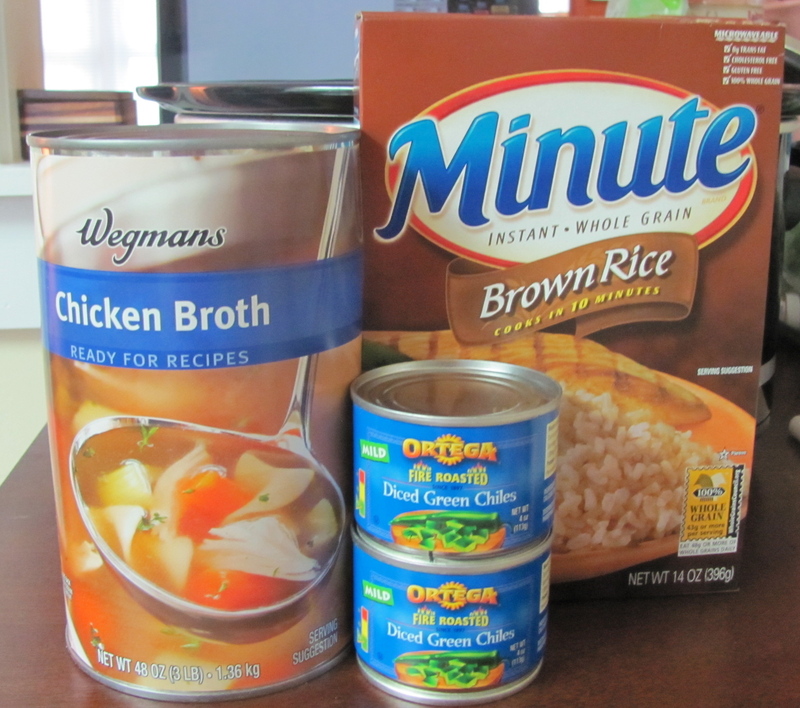 Since I’m extremely curious and can’t have french onion soup at restaurants anymore I decided to create my own recipe for the crock-pot. Now I know some of my crock-pot meals have not been synonymous with “easy” but I’m hoping this one will seem a little more assemble and leave-able. 1. 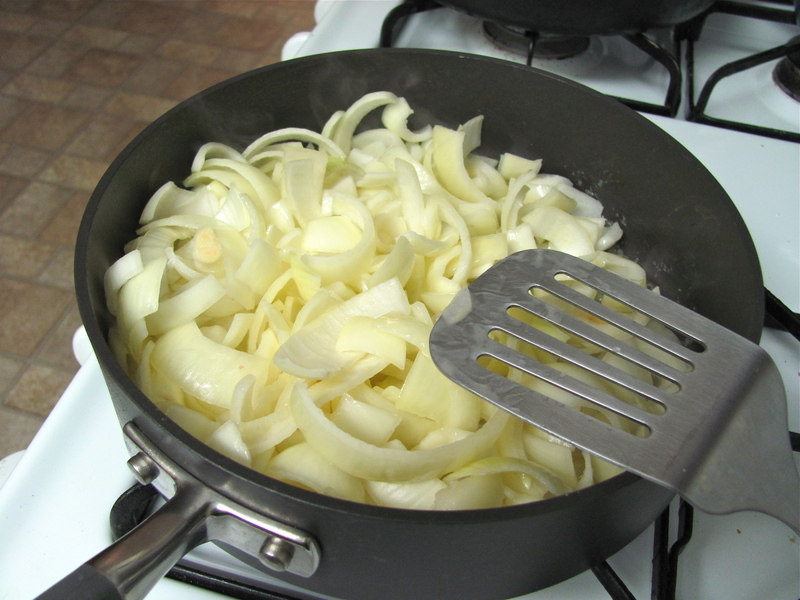 Place 6-8 tablespoons butter in large saucepan, heat on high until melted then stir in onions until they become semi-translucent, about 6-8 minutes. 2. 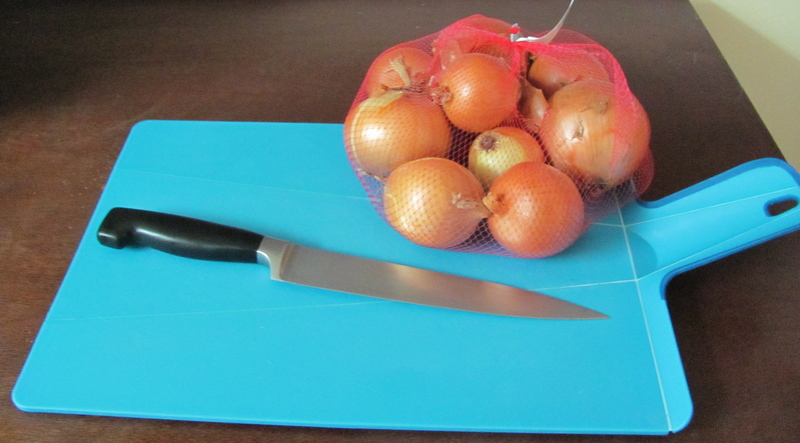 Sprinkle onions with sugar; reduce heat to medium. 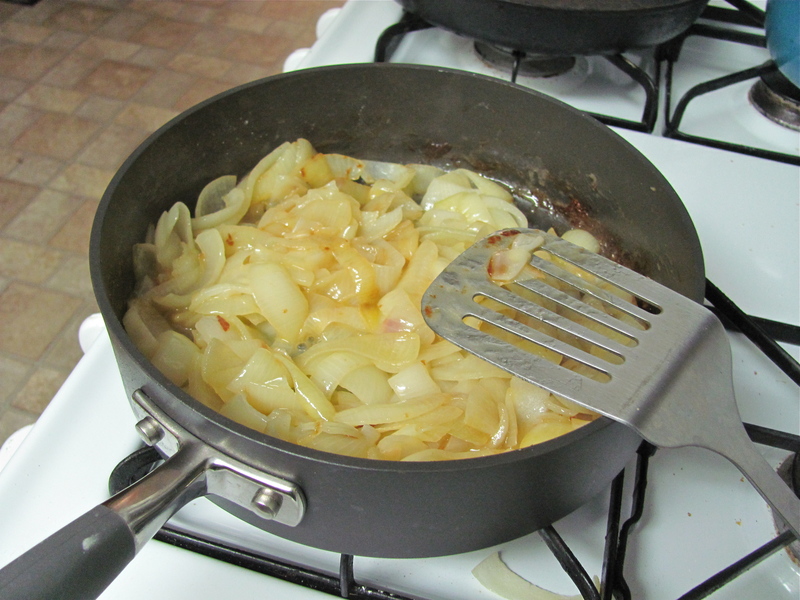 Continue to cook, stirring them often, until onions are soft and yellow-light brown (caramelized) around 20 minutes. 3. Stir 1/2 cup cooking sherry into the onion mixture and scrape up any butter/sugar that has stuck to the pan, add 1 tablespoon garlic then leave all in pan to cook on medium heat for another 3-5 minutes. 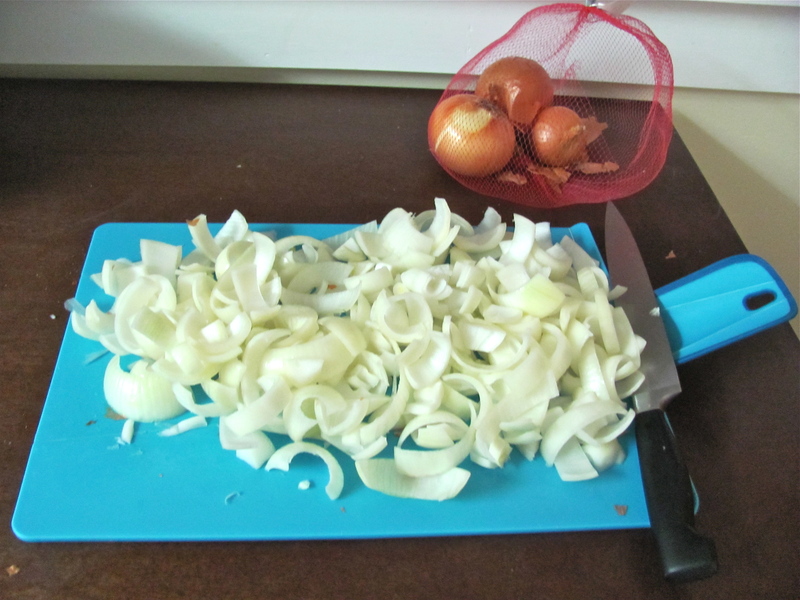 If you want to do prep ahead (even the night before) this would be a good time to cool the pan and stick the cooked onions in the fridge until you are ready to dump all ingredients into the crock-pot. 4. While the onions are browning (or when you are ready to stick everything in the crock pot) add the beef broth, bay-leafs, thyme, garlic, and salt, to the crock-pot and turn on low. 5. Transfer onion mixture into the crock-pot. 6. 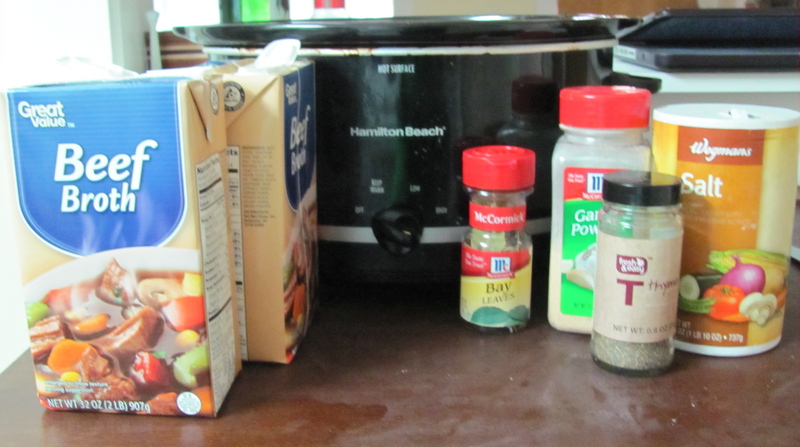 Cover crock-pot, and set on High for 3-4 hours or Low for 5-6 hours or longer. 7.When you are ready to eat, pour a bowl 3/4 full and place a slice of bread on top of the soup. Top this off with a piece or two of swiss and/or provolone and stick the bowl in the broiler for 2-3 minutes until the cheese on top is brown and bubbling. 9. Pull the bowl out of the broiler carefully and put it on either a pot holder or trivet because the bowl will be hot!!! Back in California, Luke and I would take daytime date-breaks from studying for our Masters (or just from life) and go to Chili’s. We loved their all-you-can-eat soup, salad, and tortilla chips. 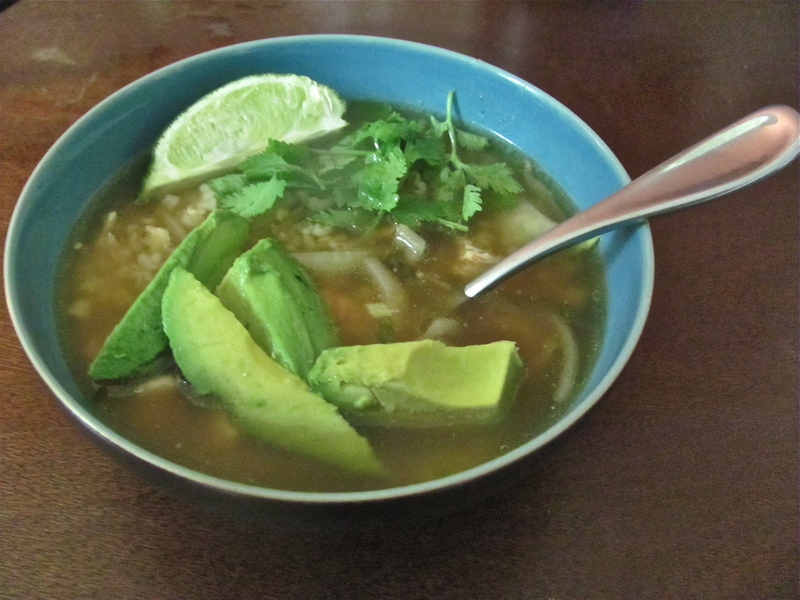 Our favorite soup was chicken lime chile. Unfortunately they stopped selling it. 😦 By that time, we were addicted to this light zesty soup. Since then we’ve been working on our own recipe. 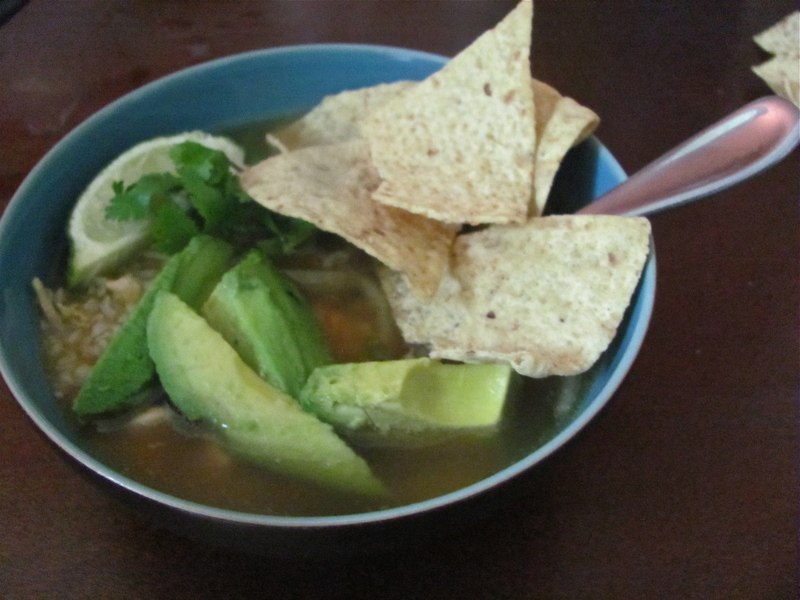 So here is my attempt at a gluten-free crock-pot Chicken Lime Chile soup! 1. 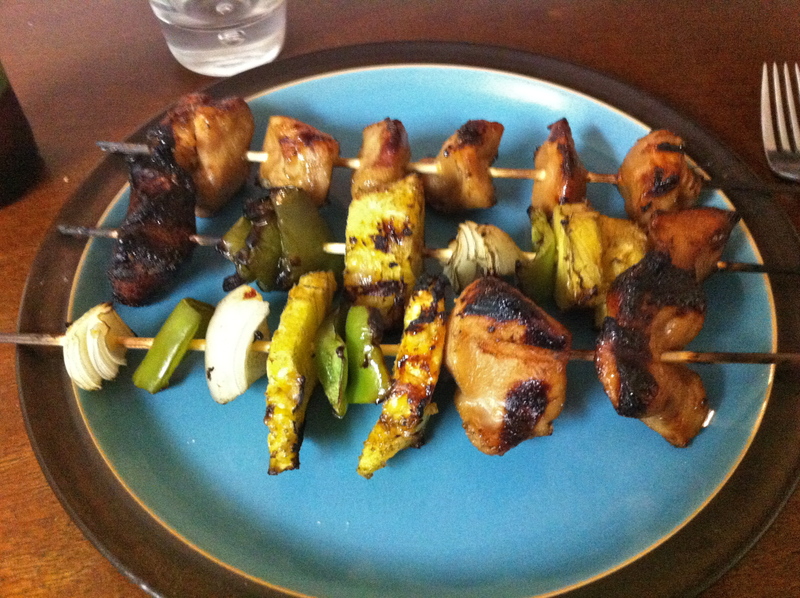 Cut the chicken breasts into kebab size chunks or long strips. 2. 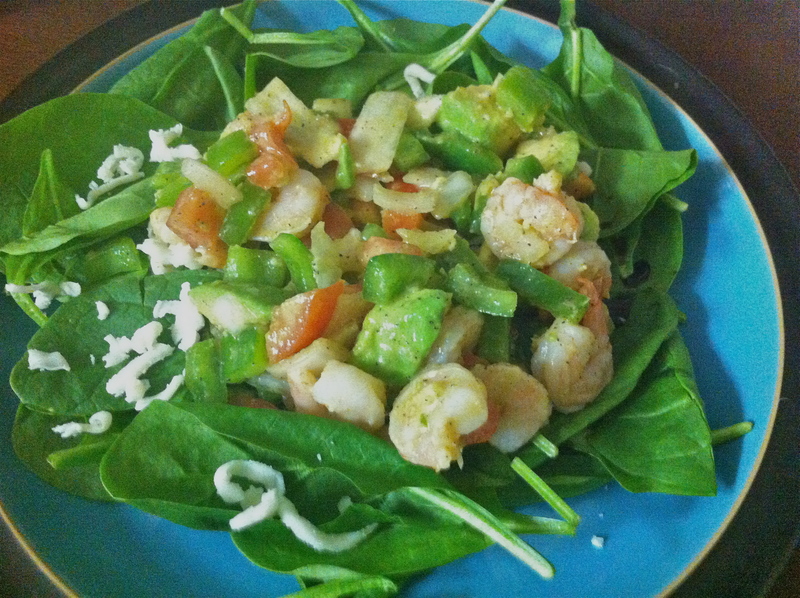 Put ¼ cup olive oil and 2 to 3tbs lime juice (about 1/2 limes) in a medium unheated pan. 3. 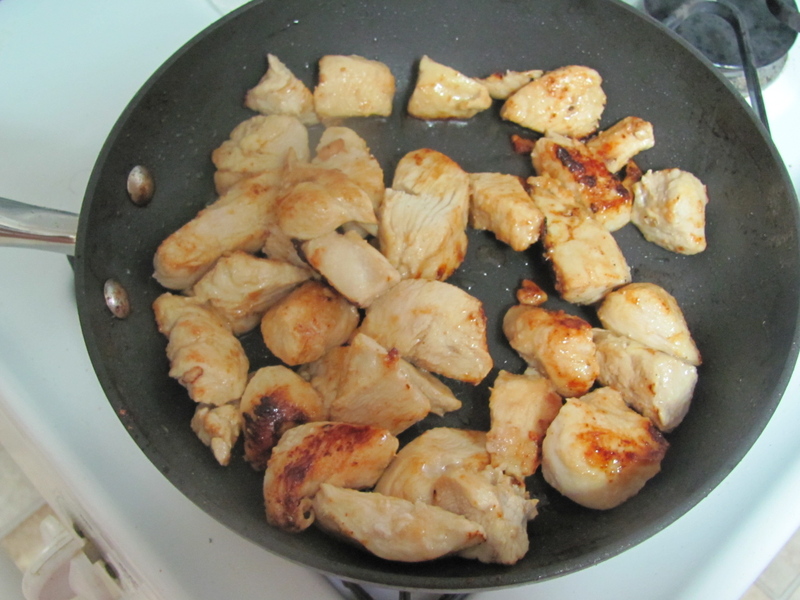 Add the chicken to the pan and season with 1tbs or more of garlic and ½ tsp salt. 4. Turn the stove to medium/ high heat and let the chicken pan-fry until brown. 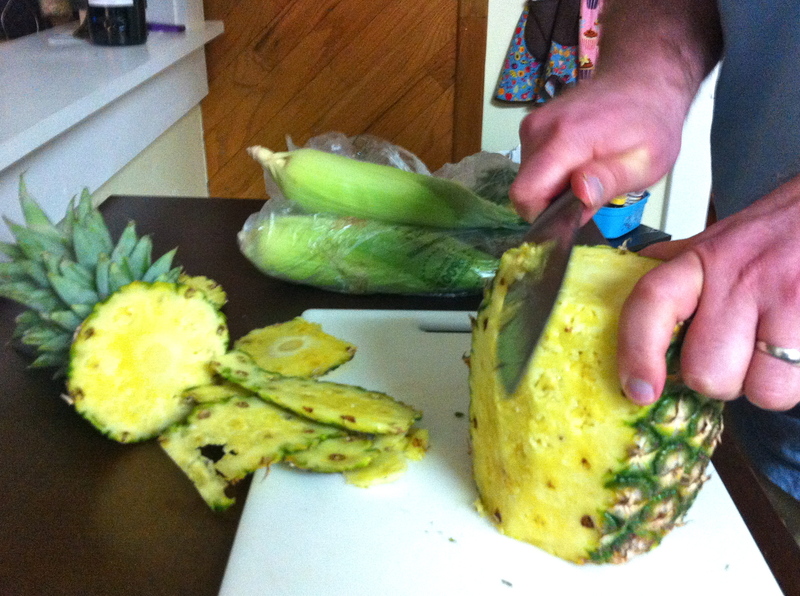 When brown, cut into the thickest piece to double check it that it is done. 5. While the chicken pan-fries, place the 48 oz container of chicken broth, 8 oz canned green chilies, and ¼ cup olive oil into the crock-pot. 6. 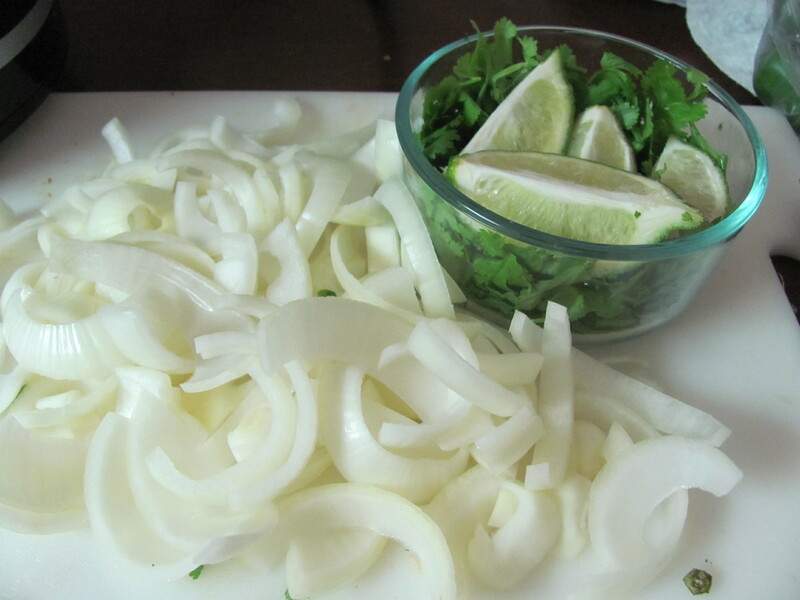 Cut up the onion and 1 to 2 limes into quarters. 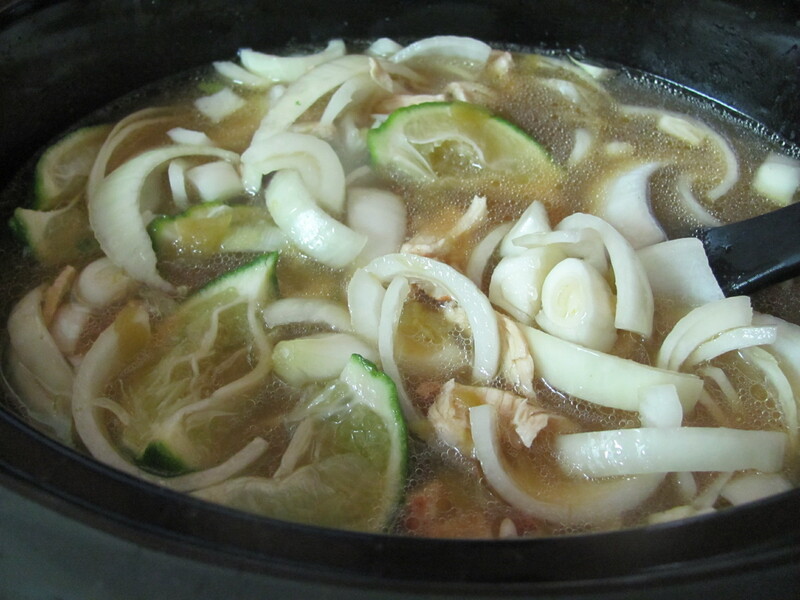 Squeeze the juice from the lime(s) into the crockpot and drop the lime rind(s), onion, 1tbs garlic, and 2tps salt, into the crock-pot and turn on low. 7. 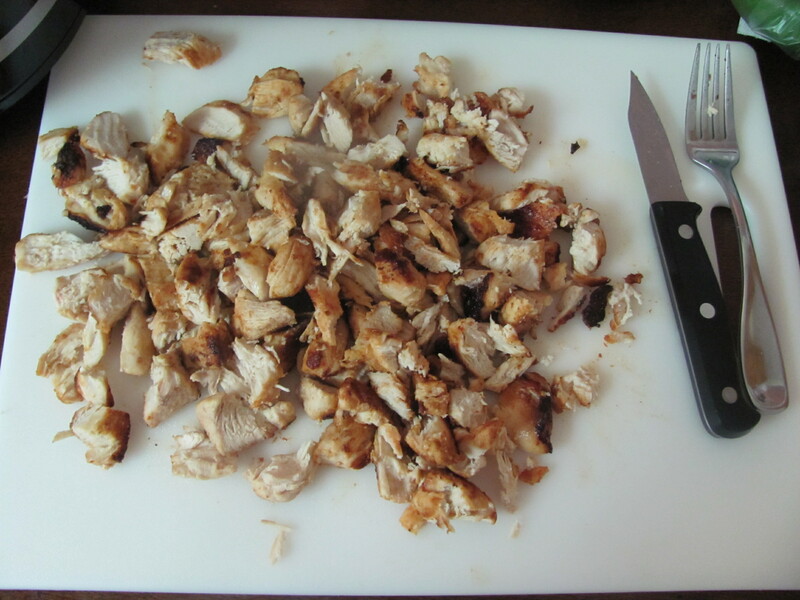 Cut or tear the cooked chicken into small pieces. Add the chicken and any oil left in the pan into the crock-pot turning it to high heat for an hour. 10. 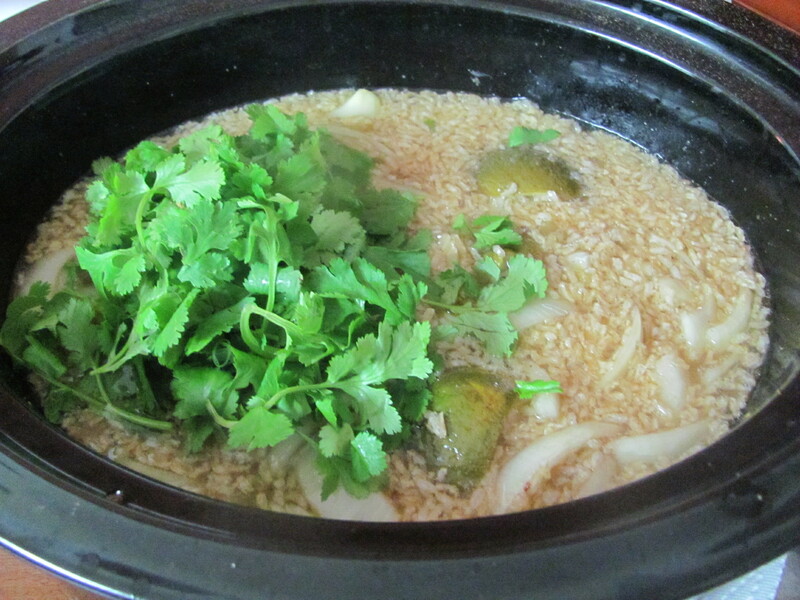 After the hour on high, add 1 to 2 cups rice and the cilantro to the crock-pot and cook on low for another hour. Also taste the broth to see if you want to add more lime or remove the lime rinds so the soup does not become too acidic. 12. After this hour on low the soup should be done. You can keep it on low or keep warm until ready to serve. 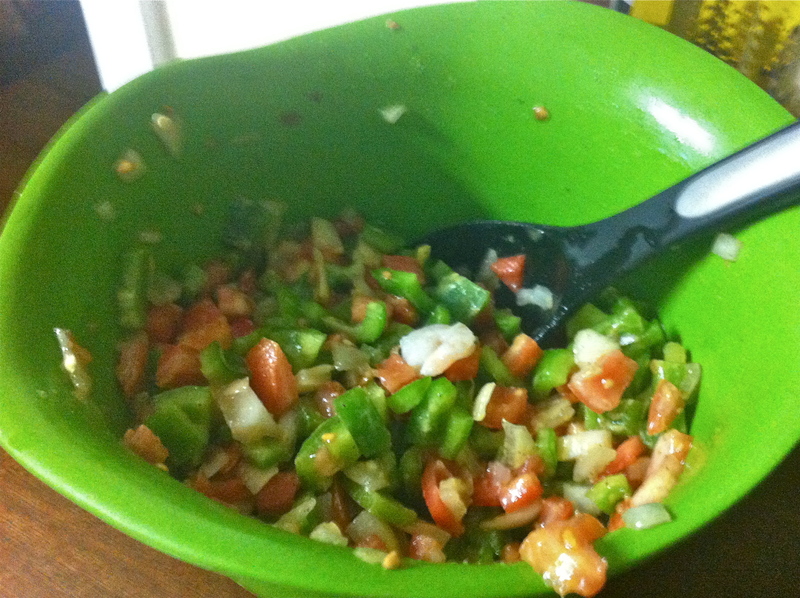 Just remember the longer it cooks after the jalapenos are in the spicier it will get. 13. 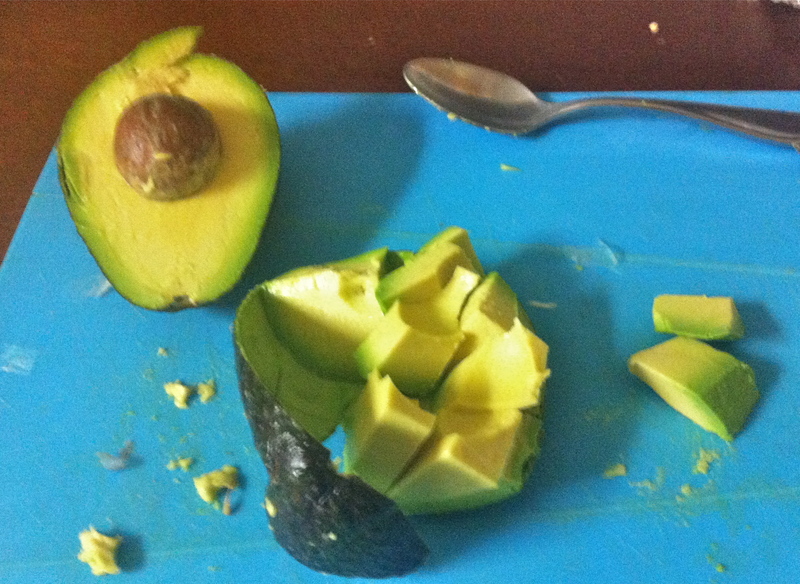 When you are ready to serve, add freshly cut avocado, more lime juice, and fresh cilantro to taste for each bowl. 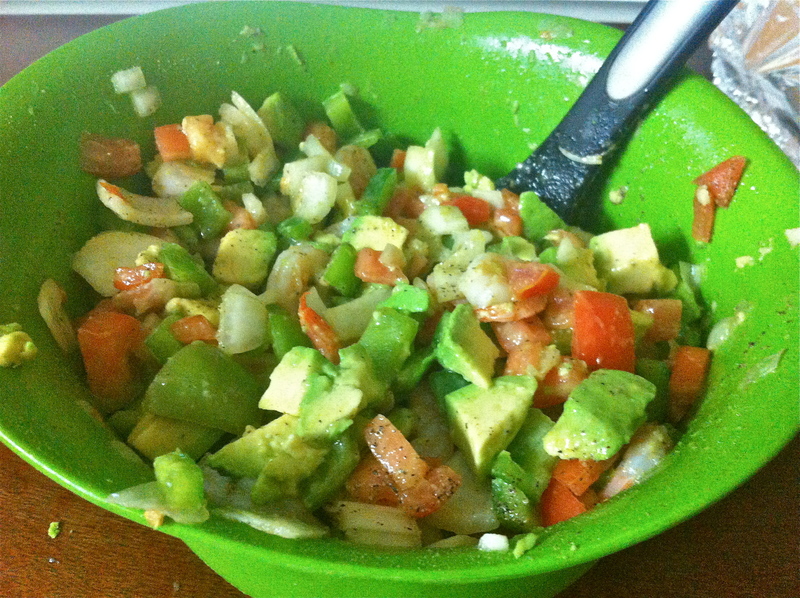 Serve with tortilla chips and enjoy! Do you have a favorite soup or dish at a local restaurant? 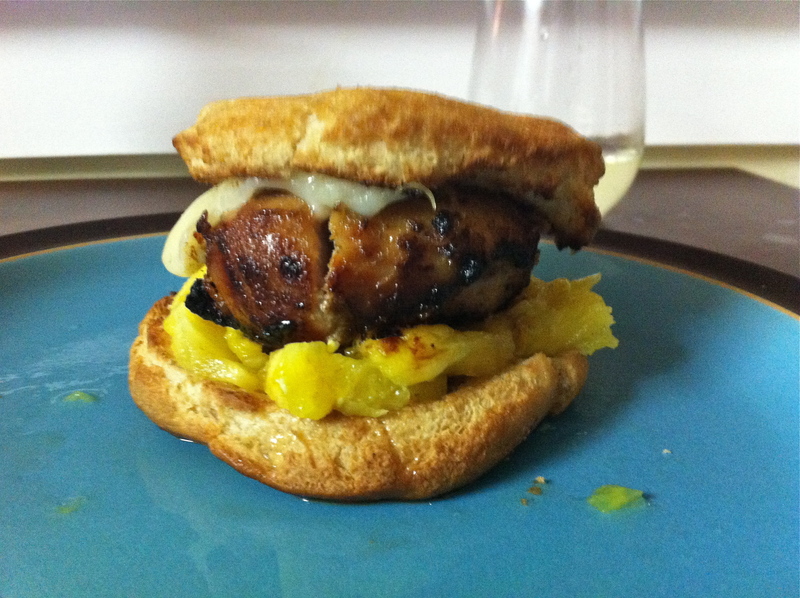 With Easter less than a week away, I thought you might appreciate a good spring brunch recipe. 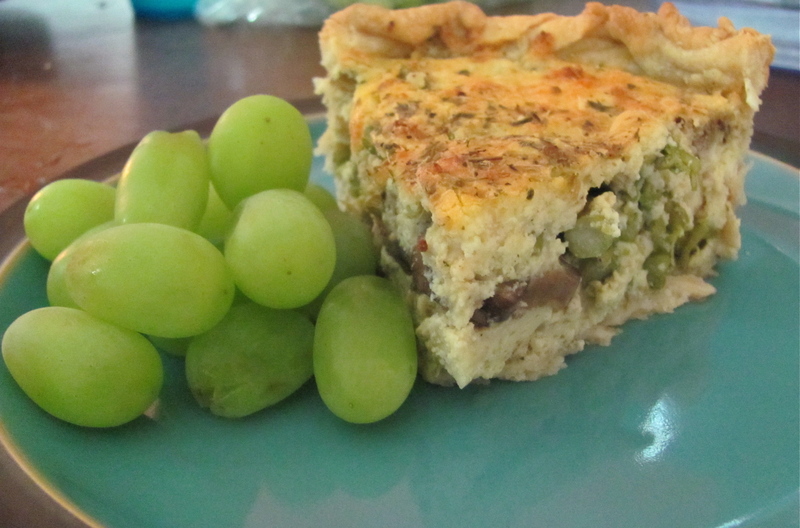 This quiche requires a little prep time but it can be done hours or even a day ahead of time and left overs are great for lunches. 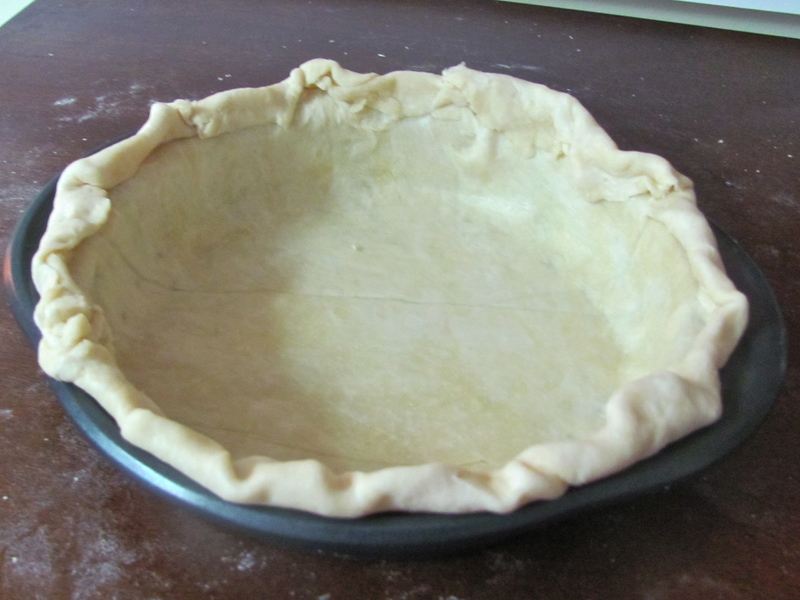 *Whether you are using a pre-made/homemade crust or no crust at all (gluten-free) make sure you butter the pie pan. 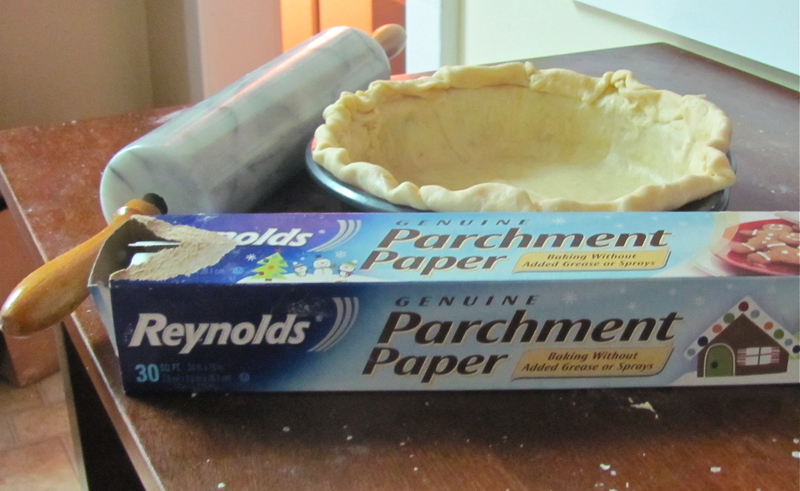 Tip if you are making your own crust: Stick your pie crust dough between two pieces of parchment or wax paper then use a roller. 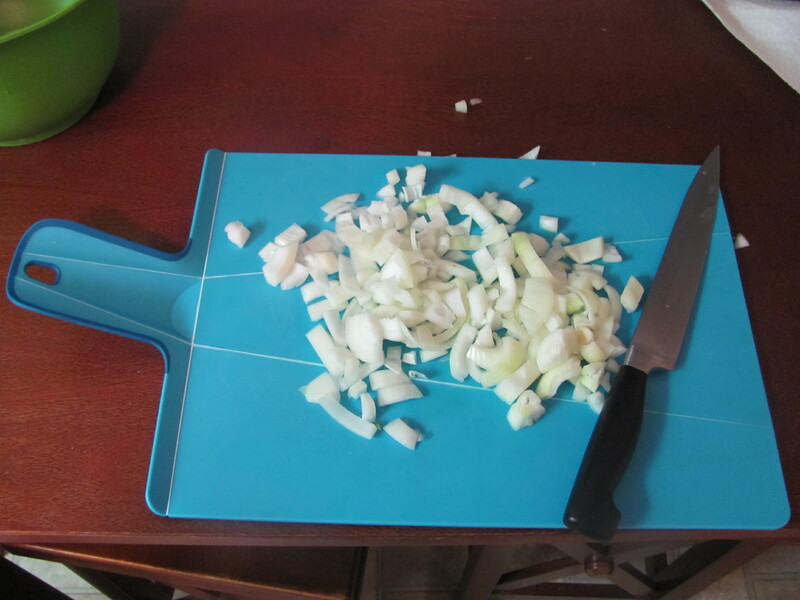 Once it is rolled out, take the top paper off, flip the crust over the pan, peel off the other piece of paper ,and line the pan with the crust. This way you do not have to use a floured surface, your rolling pin never has to be washed, and best of all-you can reuse the parchment paper!!! 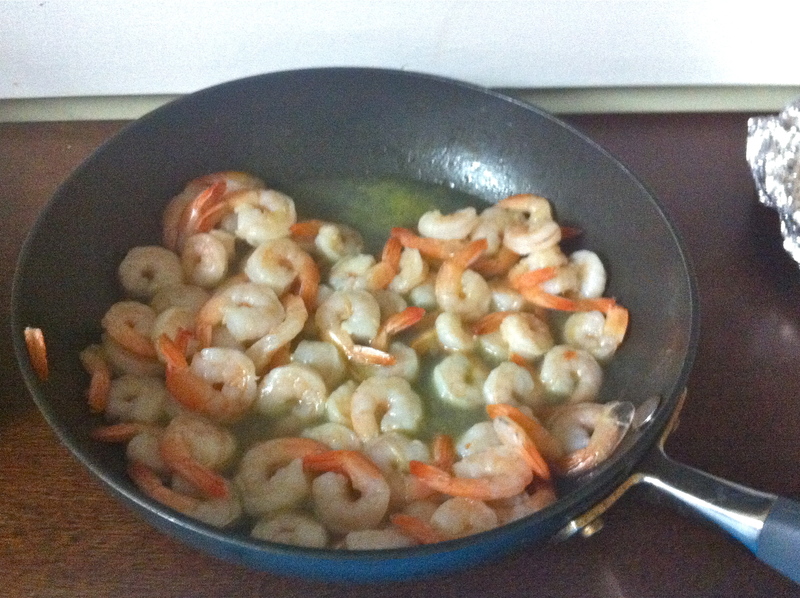 -Heat olive oil and/or little cooking sherry in a large skillet over medium-high heat. 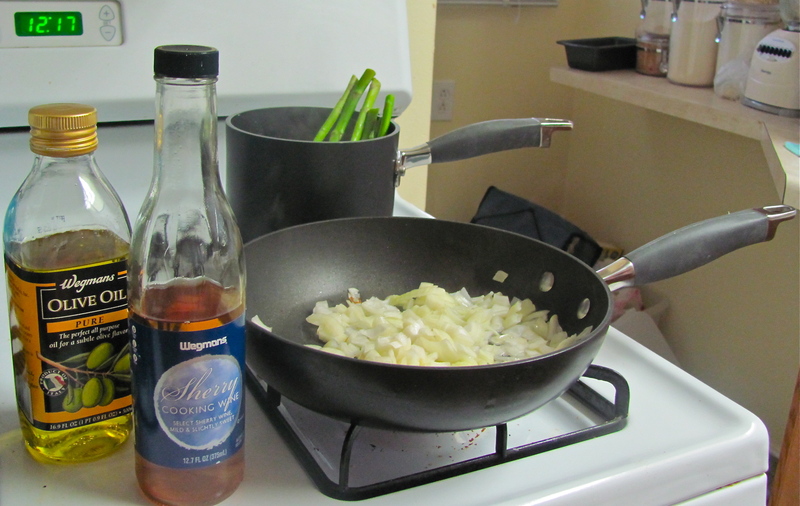 Add chopped onions; cook and stir until onions begin to brown (with sherry) or translucent (only olive oil). 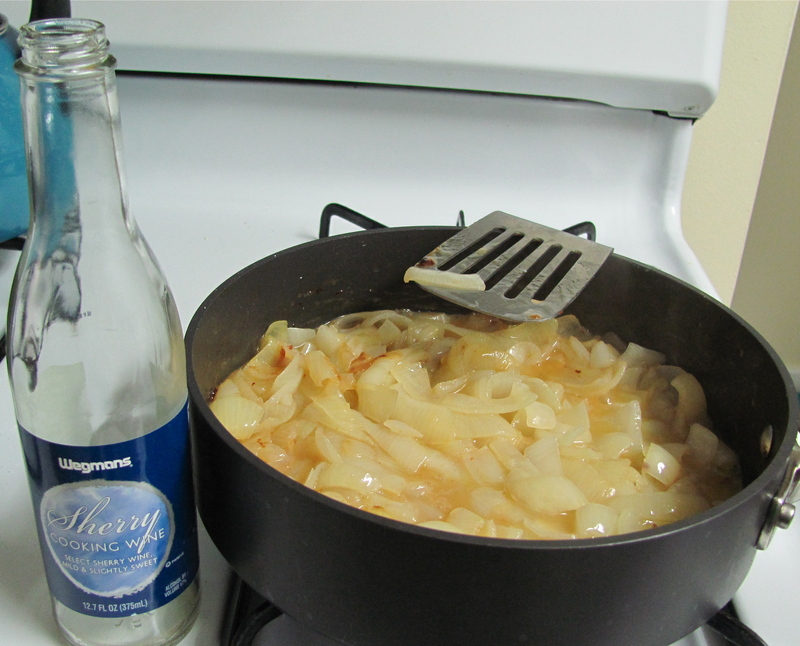 (The cooking sherry caramelizes the onions/mushrooms adding a sweet taste to your savory dish). 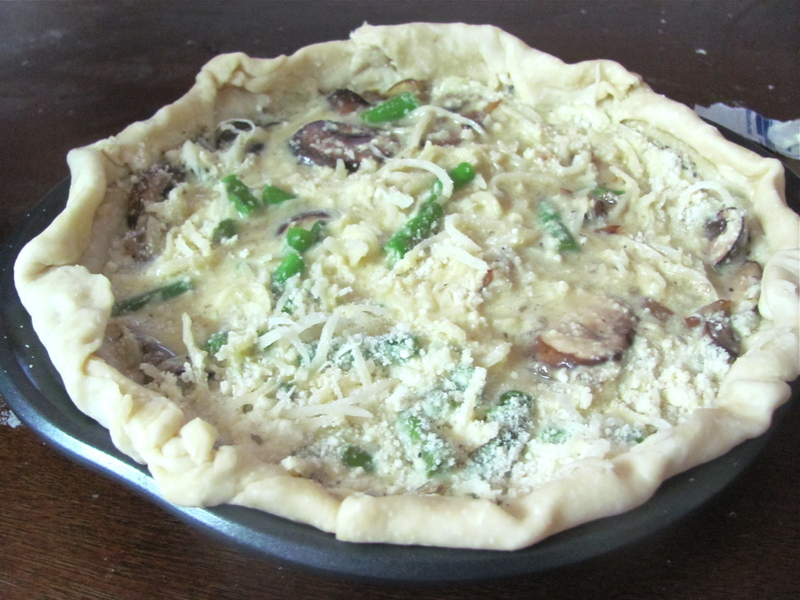 Reduce the heat to medium and add the mushrooms. 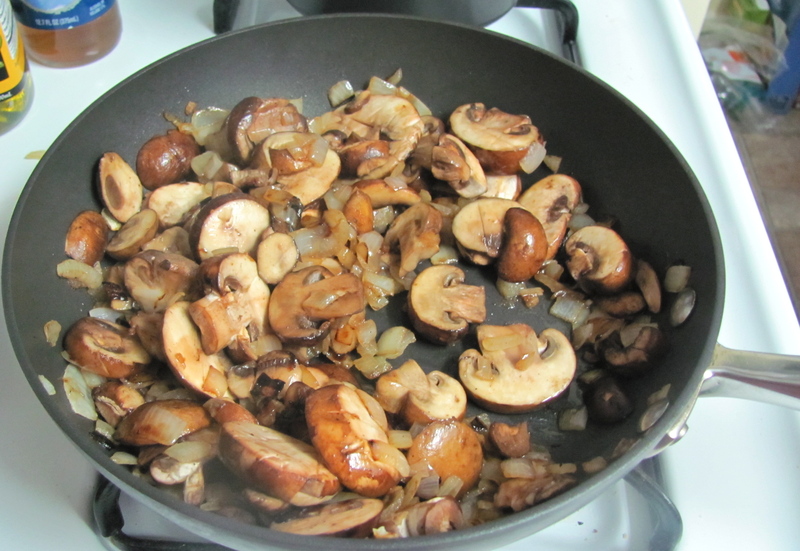 Continue cooking until the mushrooms are tender. -Bring a small pot of salted water to a boil over high heat. Wash and trim asparagus then place them in the boiling water. Let them cook for about a minute and a half . (If the whole stock is not submerged in the water then flip them over and repeat.) Immediately after, drain the hot water and run under cold water to cool-let it sit on stove unheated. 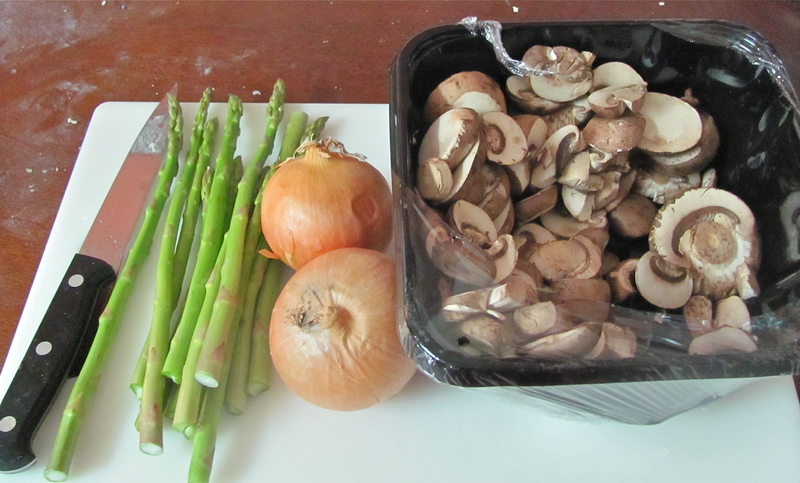 -When cool, chop the asparagus into ½ to ¼ inch pieces. 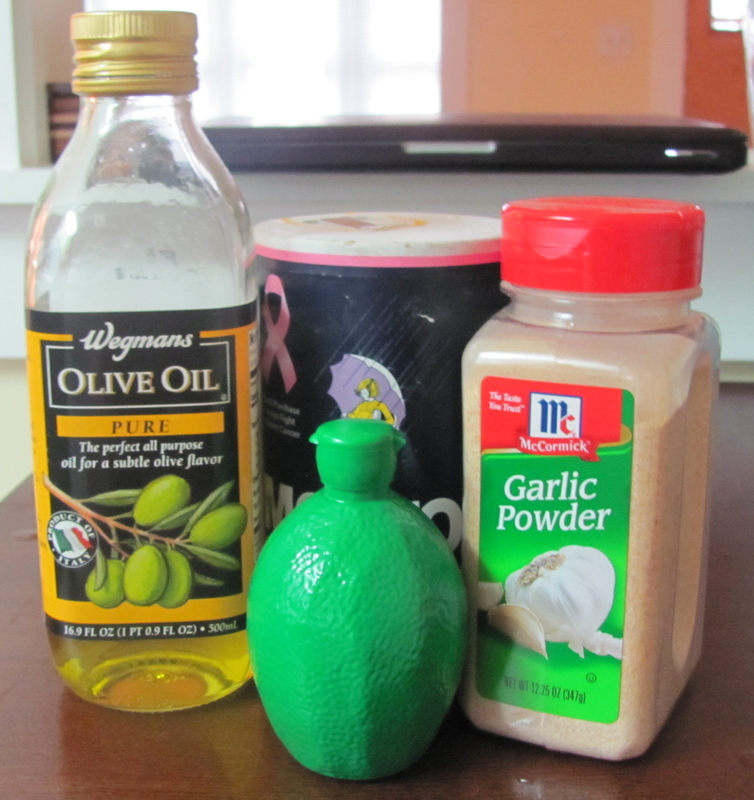 – In a small bowl, whisk together the 3 eggs, heavy cream, milk, salt, pepper, garlic powder and oregano until smooth. 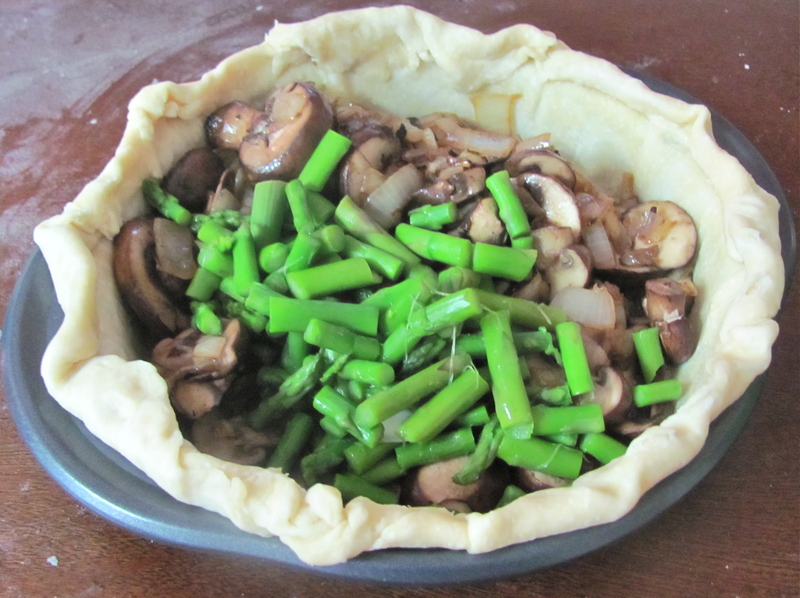 -Then place the onion/ mushroom mixture, and asparagus, into the bottom of the pie shell. 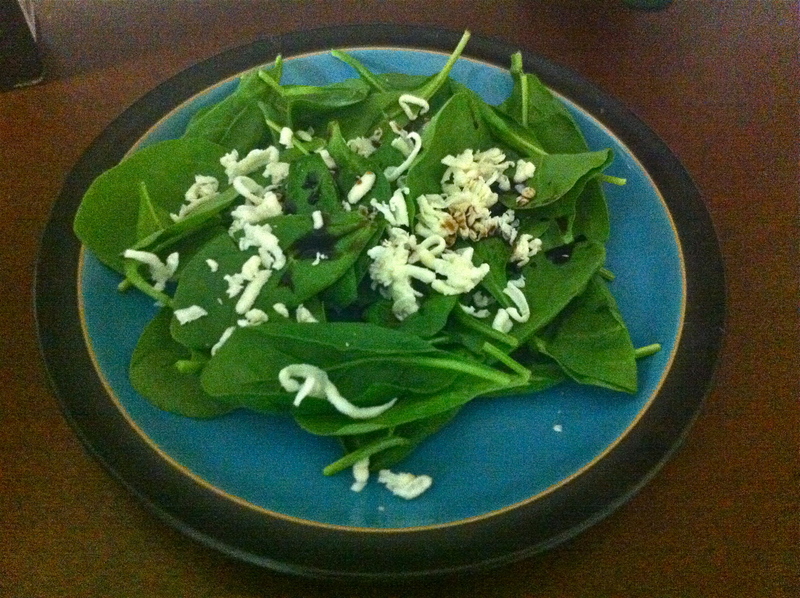 – Next sprinkle cheeses over the vegetables. 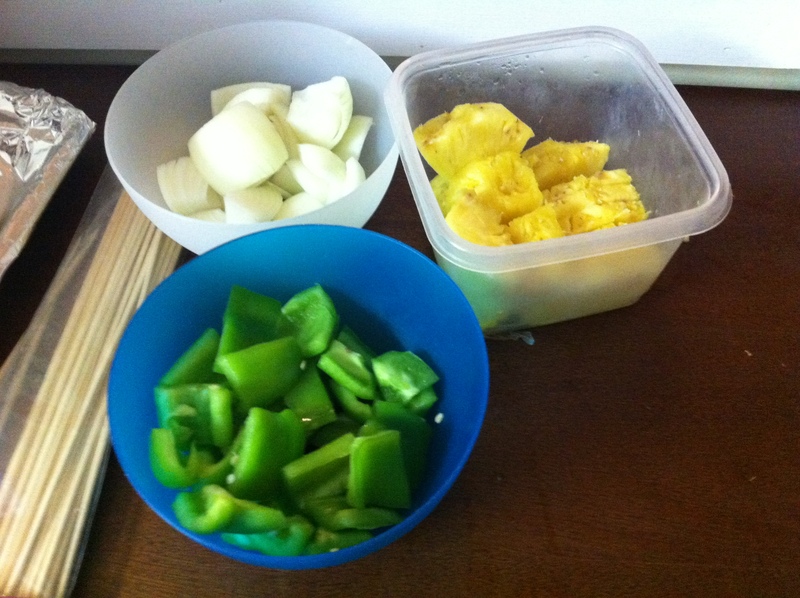 -After pour the egg mixture over the vegetables and cheese. 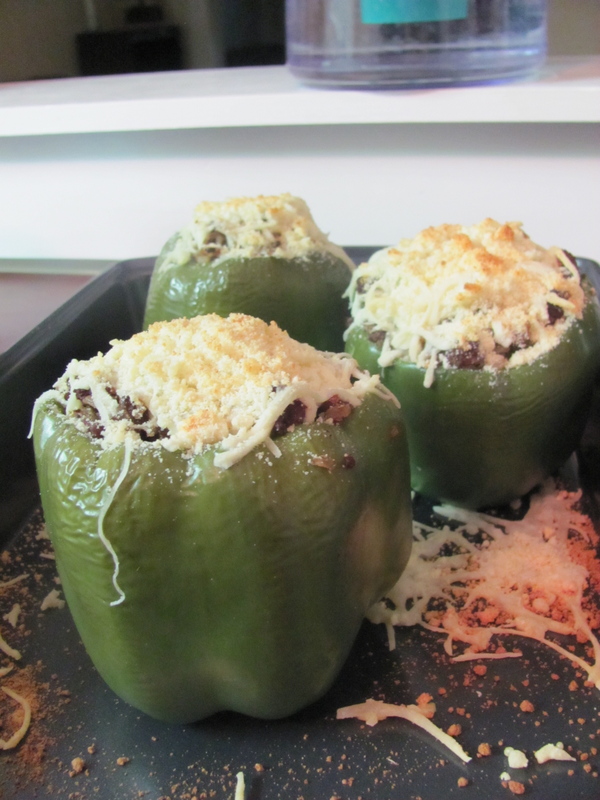 – Sprinkle the top with more oregano and parmesan cheese. 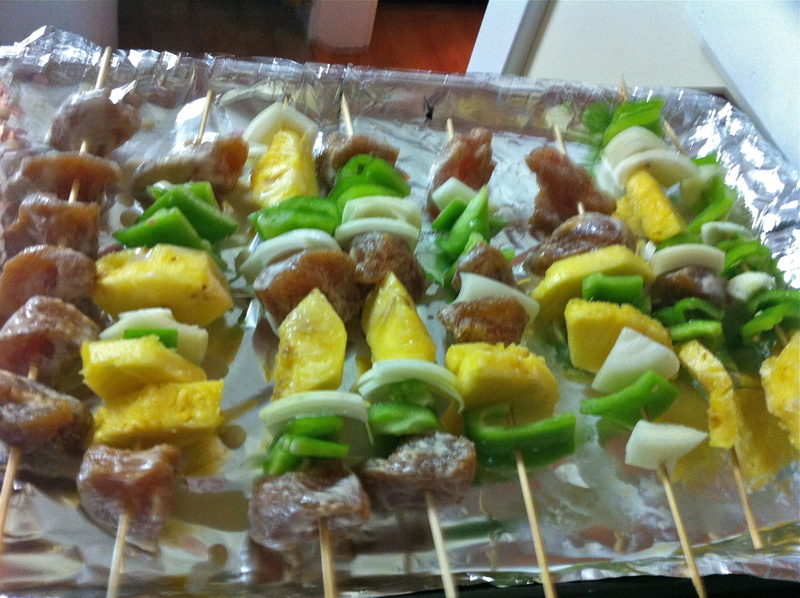 -Bake uncovered for 35 to 40 minutes, or until firm and lightly browned on top. 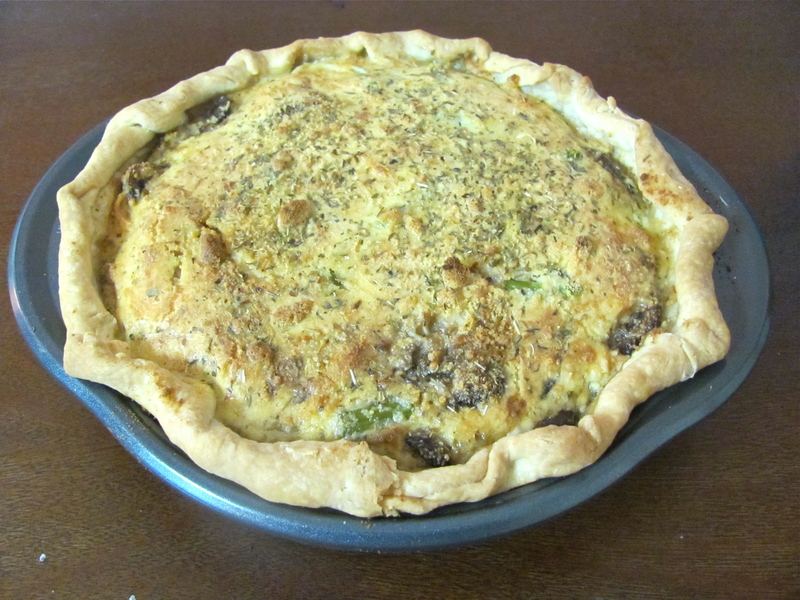 Although I am posting this right before a very typical brunch holiday- I myself make this quiche about once every 2/3 weeks (yea it’s that good). 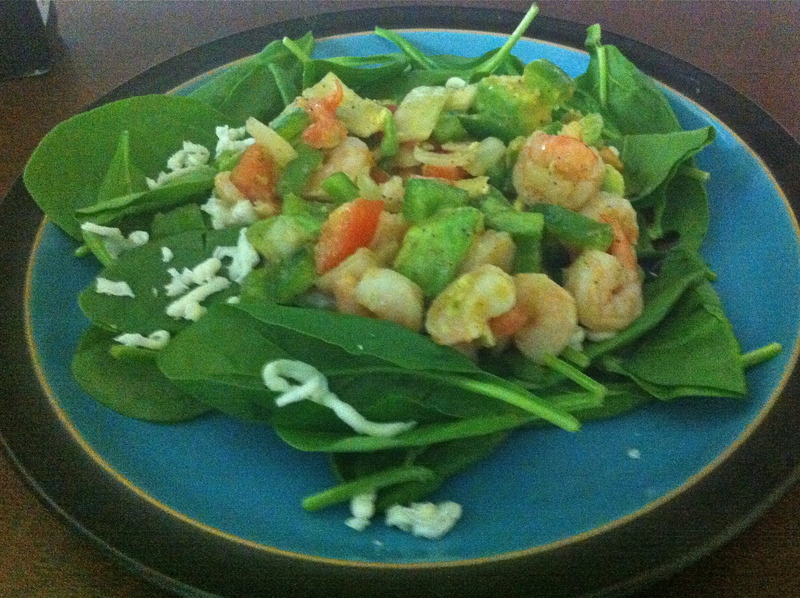 Do you have a favorite spring dish? 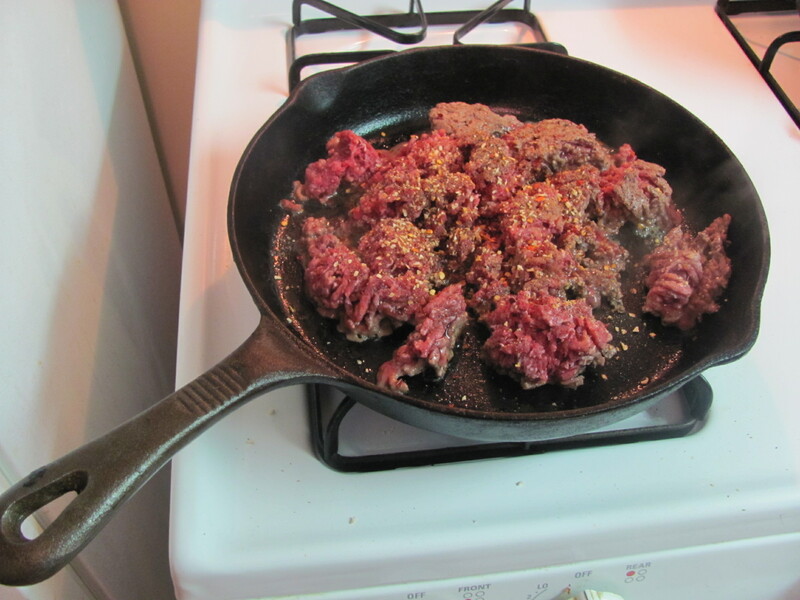 Cook up a pound of ground beef (I usually use 90/10 some fat= flavor) and spice it up with crushed-red peppers, minced garlic, salt and pepper. 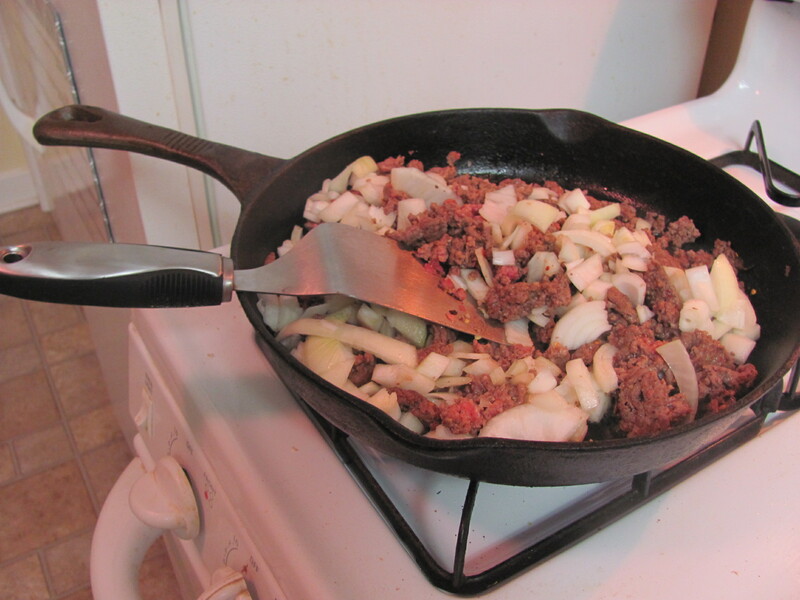 When the ground beef needs about 5 minutes more add coarsely chopped onions adding texture and flavor. Boil a combo. 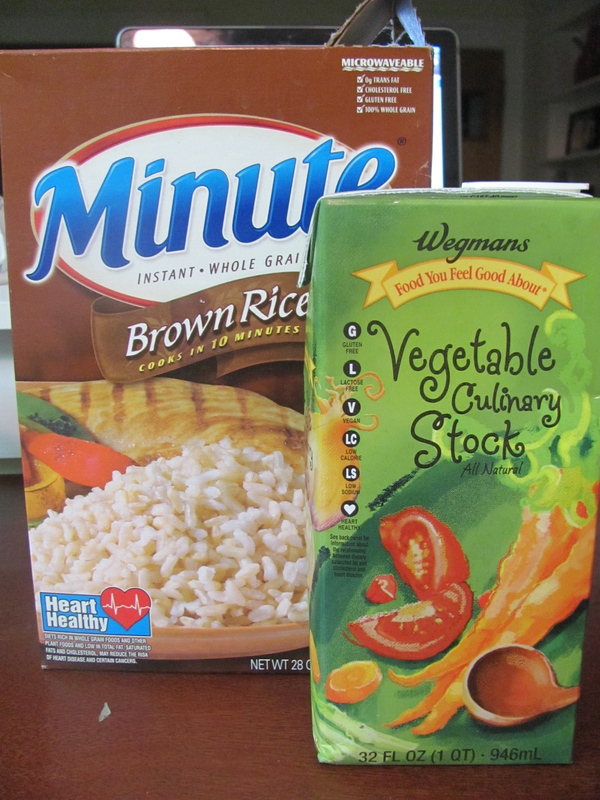 of vegetable stock and water (2/3 stock 1/3 water). When the mixture is boiling put in the Brown Minute Rice. After lowering the heat add some minced garlic, and let it simmer so that the flavor seeps in (risotto style). Clean out the peppers (kind of like pumpkin gutting.) I usually leave some of the seeds (again for texture). 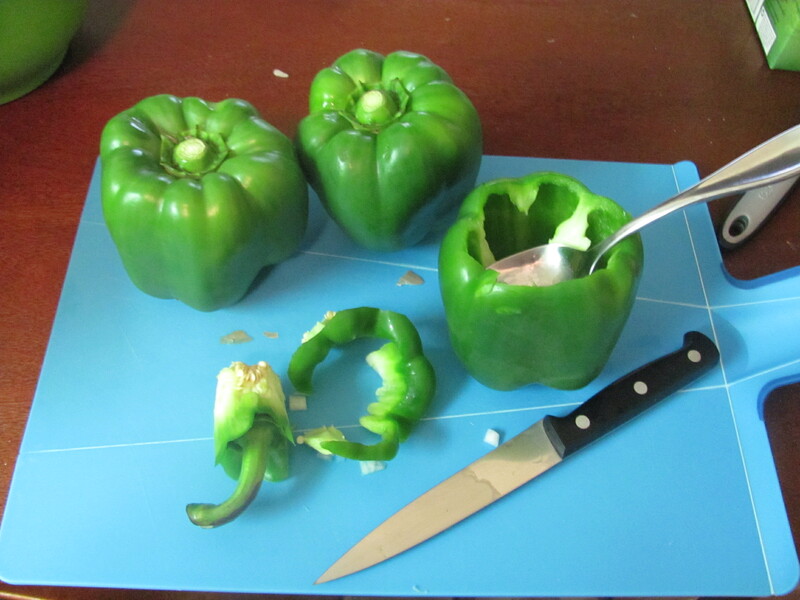 Try to pick peppers that have a sturdy and wide bottom so they can stand on their own. Then it’s time to mix the rice, and onion/beef mixture into a bowl and season (again). 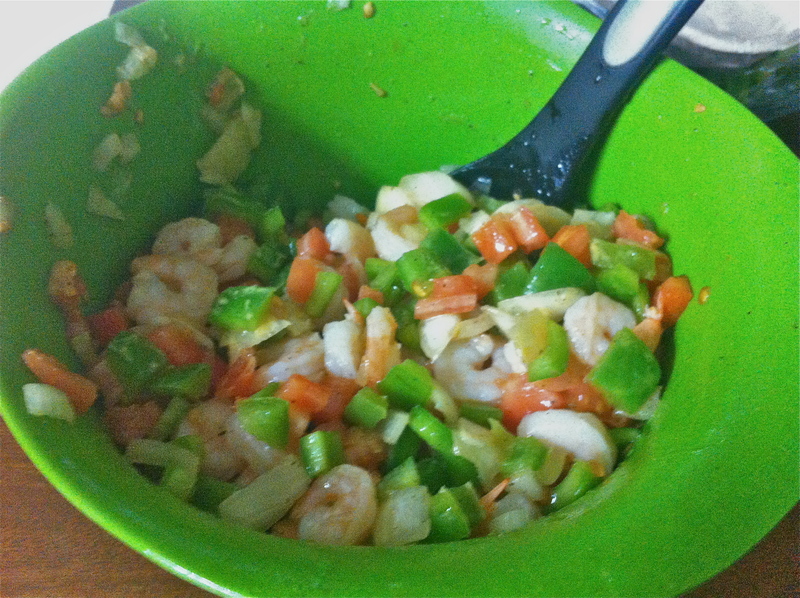 This time I usually add a little more red pepper, garlic, and oregano. The great thing about this meal versus meatloaf is that it’s all cooked before it goes in the oven. So you can taste-test your filling to see what savory seasoning you want! 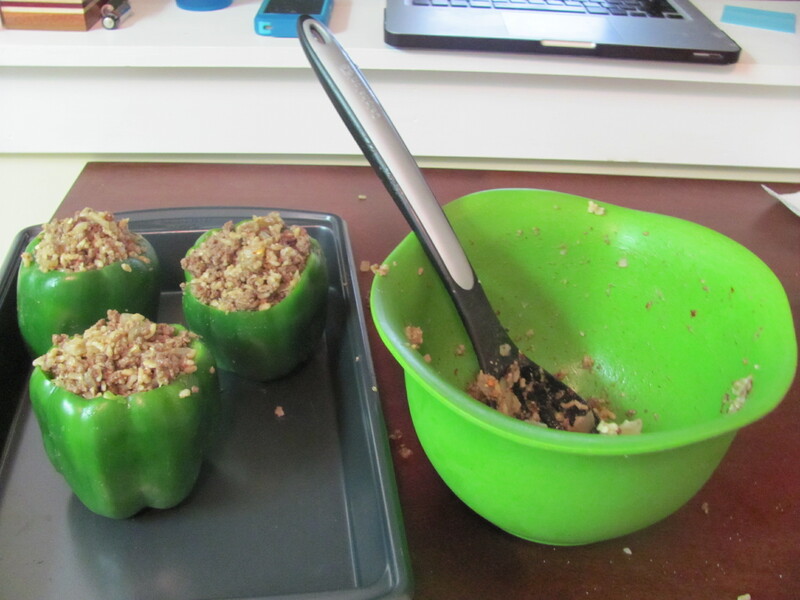 Next is stuffing the peppers. 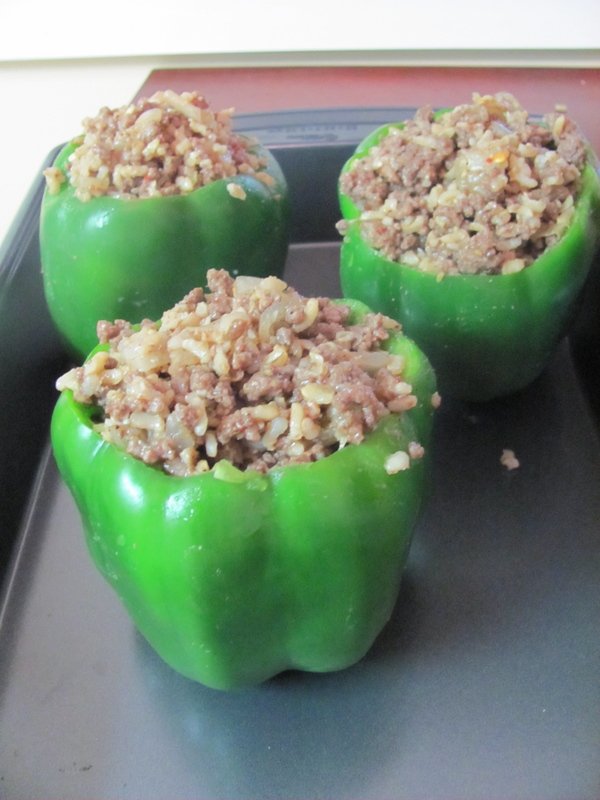 How much of the rice/beef mixture you have and how big your peppers are determine how many stuffed peppers you get. If you have any stuffing leftover: just get a spoon out and you have a pre-dinner snack! Stick the peppers in the oven for 30 min. at 350. 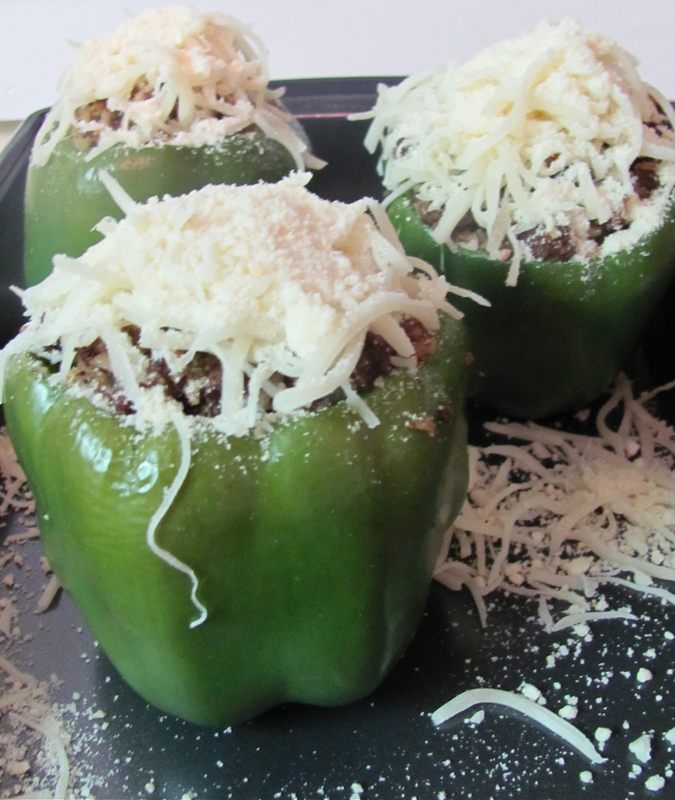 With 10 minutes left pull the peppers out and put a little parmesan and mozzarella on top. Then they quickly are back in the oven. I can only eat one Luke will eat at least two and debate whether to leave the next (if there are more) for lunch the next day. 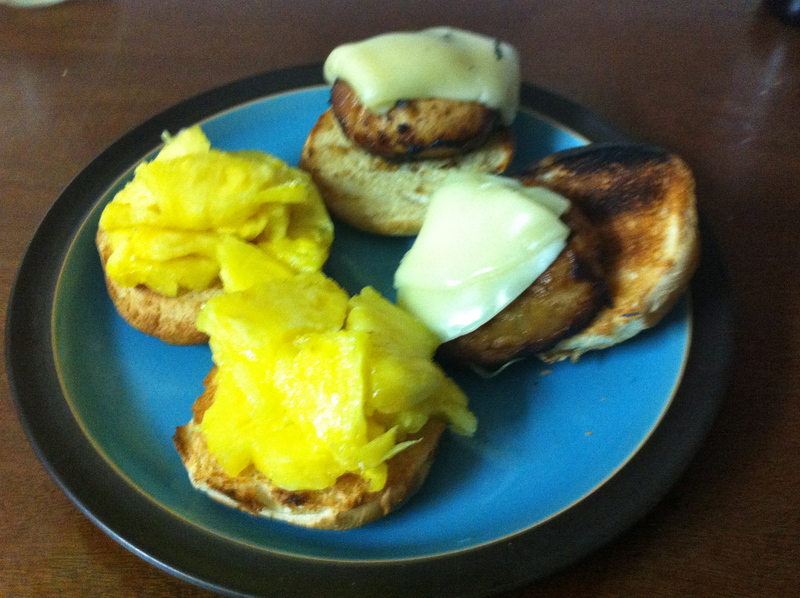 Not only is this gluten/barley free but it can also be vegetarian! 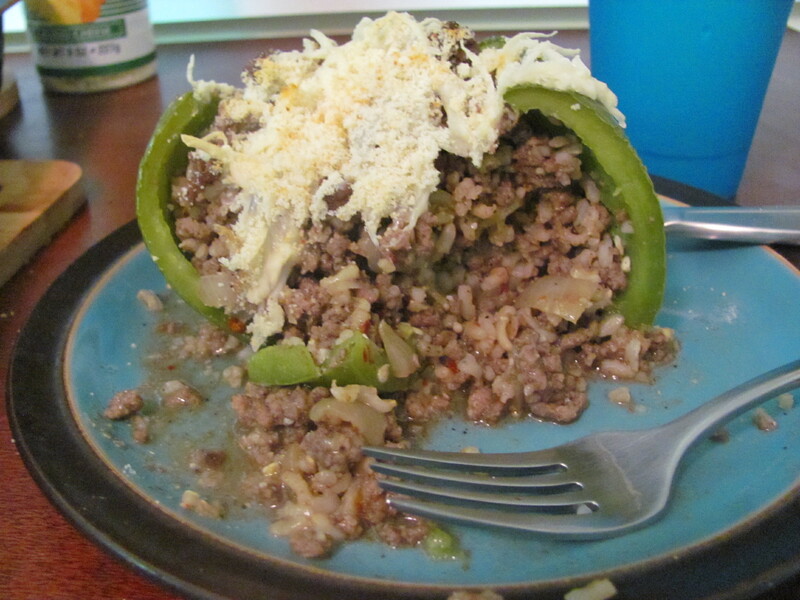 Just replace the ground beef with diced mushrooms and/or lentils! Or if you want a more Italian variety throw in some zucchini and Italian seasoning into the mixture and top it off with some tomato sauce . If you want a different carb. how about quinoa, or polenta?